Symbolism is all around us, and you only need to lift your eyelashes once to be immediately inspired. Iconic. My left foot is indeed something of an iconic thing that is hell-bent on creating trouble. Past ruptures of Achilles tendons, flipping ankles, falling over my own feet… they have seen and done it all. However, when I was told I would have to start wearing ‘proper’ shoes and that I would have to add special insoles to stabilize my left foot, I had to rethink my existing shoe wardrobe yet again. Ballerina shoes, Converse All Stars, high heels, flip-flops and Uggs do not make good footwear, at least not when your feet have a mind of their own. Apparently, Clarks shoes would not be suitable anymore either, and since I used to have a thing for their shoes, it was kind of a let down… major withdrawal symptoms would be felt! What started it all was a bad limp, and I couldn’t remember if I actually flipped over my ankle or if I heard it make a snapping sound when the pain started. It was summer, I was wearing ballerinas all the time and my belief was that indeed my left foot went over on itself, but when I started limping more and more as time went on, the worse the pain became. I had to get off the staircase bum-wise because I was not able to stand on my left leg anymore. So off I hopped to the hospital… in came a cute orthopaedic gent in A&E and out I went with a phone number. Unfortunately, it wasn’t his mobile phone number but that of the physiotherapy department instead, and I was ordered to see them as soon as possible. ‘Fair play,’ I thought, ‘worst-case scenario: they would have to cut off my foot, replace it with an un-flappable one and off I’d ride into the sunset.’ No such luck though. One physiotherapist said it was my old Achilles tendon playing up (I had gathered that much by myself already); another one thought it was a severe inflammation in the ankle itself. The latter, now that I did not expect to hear because my long history of foot-trouble was already long enough. It was that painful I felt like knocking the physiotherapist on the chin with my heel, and even a very light touch would send me up the walls and into the candelabra. Different approaches were used trying to settle the inflammation at every physio session, but after 3 months, I was still in a lot of pain despite doing home exercises, wearing special bandages and other medical equipment. Since I have a neurological autoimmune illness, however, my body needs a lot more time to heal itself, and I was not going to take another 6 months of limping. My left foot and I became enemies, and that was and still is a fair representation of our now-unexciting relationship. Grace to some fantastic friends’ input, they agreed that indeed the boots would be so, so good for my feet. On I went to buy a pair of pitch black Docs and I walked out of the shoe shop with such a big smile on my face the shop owner must’ve thought I was high on drugs. Mind you, the boots are not cheap, but they will at least last a good few years or longer if I look after them. And I look after them as if they are my prize turkey, only they do not cackle as much as turkeys do! Since buying them, I realize that the boots are all me, and they make me, me. They protect my feet from trouble and they make me feel strong and deliciously alternative! People have stopped me on the street to say that the boots look fabulous and that they must be so comfortable. 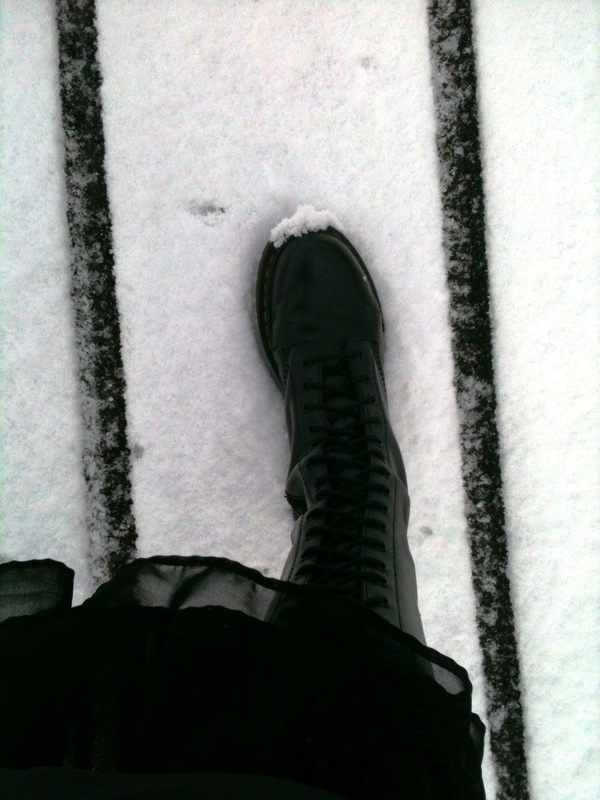 I also had a skinhead tell me the boots looked fabulous and that he’d know because he’s a skinhead. In all fairness, he didn’t really look like a skinhead but who am I to judge people’s appearance. 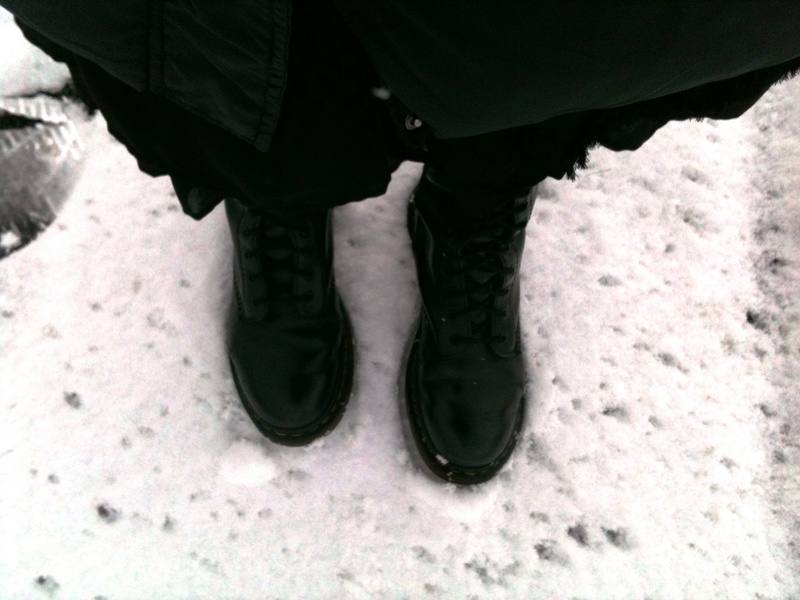 I am not a skinhead, yet I do love Docs, so appearances can be vague ideas of all things invisible. I was happy hearing another comment on the boots so mission: accomplished. Both my feet and the rest of me are happy! Out went the bad shoes, in came the new boots and I haven’t looked – or stepped – back since. Needless to say – being of the female kind and in love with fashion as long as it’s on my terms – I found a new dress sense: knee-long dresses and funky accessories to match the boots and I feel like a new me stepped forward. So much so that I now feel rather…er… naked if I don’t wear the boots… the yummy, stunning boots. I always felt a little different to other women in that I am not the hopelessly romantic, high-heeled, short-skirted sort but I am more the ‘my style, my rules’ type of female. Aside from a book fetish, a Dr Martens’ boots fetish is now firmly in place also! The Dr. Martens boots do just that: they make me feel alternative and I know that this is exactly the person I am meant to be. Different, interested in zigzagging lines where everyone else is walking in a straight line. The boots give me my own identity opposed to getting lost in high street fashion. That is just about how I would describe something that has become part of me, and I now feel lost when I wear a different type of shoes or clothes. Before, I used to travel with at least three pairs of shoes in my suitcase, now I only travel with one… those I am wearing. It saves space in my suitcase and I have gone from traveling with a large suitcase to one I can take on board with me. My Achilles tendon only plays up every now and then these days, and while I have an orthopedic review in May, I hope that the boots will continue to prove so worthwhile. They helped me get rid of agonizing pain and the swollen tendon is no more. I cannot complain so! Now I think of buying the dark cherry coloured 20-eye boots, just to smack some more punch in my wardrobe and dress sense. Because if any pair of shoes or boots are worth it, the iconic Dr. Martens tall boots definitely are! So glad to finally find your site….an inspiration to all who choose to meet challenges head on.Thank you for being here. Doc Martens are one of the best pieces of footwear I have ever come across and I would heartily cheer you on in purchasing the cherry-red pair. I had a pair for many years and loved their comfort and dependability. But mostly, I loved how the colour made my feet feel pretty. Go ahead and treat yourself. Boots rock! Now where did i keep mine? Same here! They’re probably the best things ever invented! Couldn’t agree more. Amazing post, you write beautifully. I usually never stop to comment unless I really can’t resist myself.